Justification: dialect, lettering and stoichedon style (Engelmann - Merkelbach). Erythrai . Found to the southwest of the Acropolis of the city. Currently in the Staatliche Museen in Berlin (inv. no. unknown). An opisthographic marble stele, only preserved on the left and bottom. The bottom of the first side (A) and the whole of the reverse side (B) preserves a lengthy paean for Apollo (principally) and Asclepius (lines 36-74). This is not included here, as well as an additional prescription (lines 75-77, in letters from ca. 281 BC) to perform similar hymns for the "son of Apollo" King Seleukos I. Variable stoichedon of 28-30 letters, with syllabic division. Edition here based on Engelmann - Merkelbach I.Erythrai 205, with ph. pls. 35-36. Note that the excerpt given here only contains lines 1-36, from the front side A (see above on Support). Cf. also: Sokolowski LSAM 24. Further bibliography: Aleshire 1991; Parker 1996: 175-185; Dimitrova 2008.
παιῶνα ἐς τρίς· "ὤ Ἰὴ Παιών" κτλ. [...] to Asclepius [...] (5) each of the two [...] and if he sacrifices [...] let him sacrifice also [to ...] to place and to [...] for goat-meat [...] (10) to Asclepius. To [...] let him sacrifice whichever [he wishes ...] to Apollo and [to Asclepius] sacrifice jointly a sacred [Hermes-cake. But if he sacrifices an ox] to Apollo or Asclepius, [on the] table, (15) let him provide [for each of the two gods] three portions of beef [and entrails and] for the priest two obols. [But if to one or the other] he sacrifices an adult animal, let him provide [to each of the two] on the table, three portions of meat [and] entrails (20) and one obol for the priest. If he sacrifices [a suckling animal], three portions of meat and entrails. [And if] he sacrifices burned offerings, [let him set aside] a flat cake (or pastille) and a Hermes-cake for each of the two gods. Whatever is placed upon [the] table will be perquisites (25) for the priest. When the city makes a sacrifice to Asclepius, the offerings of the city are to be sacrificed first and for the sake of everyone; no private individual is to make a preliminary sacrifice during the festival. At any other time, preliminary sacrifices can be made according to what (30) was written before (above?). Those who, having incubated, offer a sacrifice to Asclepius and Apollo, or who having prayed (i.e. made a vow) offer such a sacrifice, when the sacred portion is placed (i.e. on the altar), are to first sing a paean around (35) the altar of Apollo, namely the following paean three times: o, ie Paian, etc. [...] à Asclépios [...] (5) chacun des deux [...] et s'il sacrifie [...] qu'il sacrifice également [à ...] déposer et [...] pour de la viande de chèvre [...] (10) à Asclépios. À [...] qu'il sacrifice tout ce [qu'il veut ...] à Apollon et [à Asclépios] sacrifier conjointement un ['gâteau-Hermès'] sacré. [S'il sacrifie un bovin] à Apollon ou à Asclépios, [sur la] table, (15) qu'il place [pour chacun des deux dieux] trois portions de viande de boeuf, [les viscères et], pour le prêtre, deux oboles. S'il sacrifice [à l'un des deux] un animal sacrificiel adulte, qu'il place sur la table [de chacun des deux] trois portions de viande [et] de viscères (20), et une obole pour le prêtre. S'il sacrifie un [animal de lait], trois portions de viande et de viscères. [S']il sacrifie des substances à consumer, qu'il place un gâteau plat et un 'gâteau-Hermès' pour chacun des deux dieux. Tout ce qui a été déposé sur [la] table reviendra (25) au prêtre en parts d'honneur. Quand la cité procède au sacrifice pour Asclépios, les offrandes de la cité doivent être sacrifiées d'abord au bénéfice de tous; qu'aucun particulier ne procède à un sacrifice préliminaire pendant la fête. En tout autre temps, que l'on procède au sacrifice préliminaire selon ce qui (30) a été écrit (ci-dessus ?). Ceux qui, après avoir procédé à l'incubation, offrent un sacrifice à Asclépios et à Apollon ou ceux qui, ayant fait un voeu, offrent un sacrifice, quand la part sacrée est déposée (sur l'autel), entonneront le péan d'abord autour (35) de l'autel d'Apollon, à trois reprises le péan que voici : ô iè Péan, etc. The regulations are fragmentary and their beginning is not preserved, but as mentioned above (see Support), they clearly appear as part of a larger dossier of documents concerning the cult of Asclepius (and that of Apollo) at Erythrai. 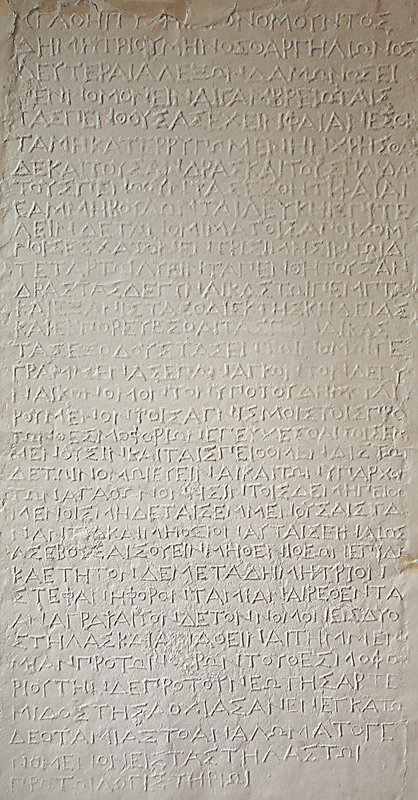 One mention in the regulations concerning preliminary sacrifices (προθυσίς, lines 28-30), refers to "what was inscribed earlier" or "above", probably indicating that a section of the regulations on this matter would have been written above the major portion of the extant text. As we have them, the regulations seem fairly comprehensive concerning sacrificial practice, though also rather miscellaneous: after several fragmentary lines, a major section concerns the portions to be offered on the table for both gods when private individual performed different types of sacrifices (lines 13-25); this is followed by a section concerning the priority of civic sacrifices during the festival of the gods (lines 25-30); finally comes a requirement for certain participants in a sacrifice to perform a specific hymn (lines 30-36). Indeed, appended to these rules, but not reprised here, is a lengthy hymn, a paean in honour of Apollo (lines 36ff. ), which is explicitly to be performed at the key moment of the sacrificial ritual (see lines 33-36). Similar hymns have been found in Athens and at Ptolemais in Egypt, and were apparently widely disseminated; cf. also here CGRN 40 (Apollonia in Illyria). The addition of a paean in honour of Seleukos I, lines 74-76, testifies to the vitality of the cult one century later; for King Seleukos' intimate connection with the cult of Apollo, notably in Asia Minor, cf. here CGRN 137 (Aigai). About the context for inscribing these comprehensive regulations of the cult we are regrettably poorly informed, though analogies from outside of Erythrai may be instructive. At Athens, the cult of Asclepius was introduced in 420/419 BC (see Aleshire, Parker). Preserved now is also a substantial dossier from fifth century Apollonia in Illyria, probably testifying to the introduction of the god in the community, with a similar hymn in his honour: cf. CGRN 40. It may be that the dossier from Erythrai is of a similar inaugural character in the early fourth century BC (alternatively, it presents a copy of the rules for the cult, inscribed at a somewhat later date than the introduction of the cult in the city). As Sokolowski remarks, the rules at Erythrai are perhaps distinctive in carefully outlining a close association of Asclepius with the figure of Apollo (this might also tend to indicate the relatively "new" status of this first god). Indeed, the rules consistently state that the table-offerings are to be made to both gods jointly (ἑκάτερωι, lines 5, 15, 18 and 23) and one line even mentions a joint sacrifice in a fragmentary context (συνθύειν, line 23). The paean (here presumably sung partly in honour of Asclepius) also clearly recalls the inauguration of the cult of Apollo at Crisa by the Cretan pirates (h.Ap. 500-519). But we need perhaps not follow Sokolowski too closely in thinking that this joint cult testifies to origins so different from other cults of Asclepius (the hymn itself, side B, line 19, points to origins in Thessaly, as in other attested cults). For the ritual pairing of Apollo and Asclepius, see particularly here CGRN 34 and CGRN 64 (both from Epidauros). Lines 8-9: Engelmann and Merkelbach, following Wilamowitz, invoke the possibility that the rules here forbade the consumption of goat-meat (thus restoring [μη]|δὲ αἰγείωι [ηδὲ ...). To support this, they attractively compare the rules for entry in the Asklepieion of Pergamon, IvP III 161A, line 13: καὶ ἀφροδισίων καὶ αἰγείου κρέως καὶ τυροῦ ... (cf. also several other intriguing examples cited by Engelmann and Merkelbach). If this plausible inference is correct, then this section of the rules would presumably have dealt with purity requirements for the sanctuary or rules for incubation (see also below, lines 27-30). For other purity requirements that specify types of food from which one should be "pure", cp. CGRN 217 (Delos), lines 1-4, with commentary and further references. Lines 14-17: For table-offerings, see generally CGRN 13 (Selinous), lines A9-10. It is clear from lines 23-25, probably a general clause of the regulation, that all the portions set aside on the table for the gods were eventually taken by the priest. For portions of beef, known by the technical term σάρξ, see CGRN 61 (Athens), line 4. The triple portions on the table are intriguing: triple portions recur in a few ritual norms, at least one of which is inscribed on an altar or table: cf. CGRN 180 (Ialysos; there, three portions of meat from the shoulder are to be offered). For priestly remuneration with a (typically small) sum of cash, see more generally CGRN 57 (Aixone). Lines 20-21: For suckling animals, see again CGRN 64 (Epidauros), lines 7-9. It is unclear if the entrails mentioned in these lines and probably in line 16 represent the totality of the entrails from each given sacrificial animals, or perhaps more likely (given the absence of a definitive article), a portion of these entrails. For entrails offered on the cult-table, see here CGRN 182 (Mytilene); for entrails placed on the hands or knees of divine statues in Chios, see CGRN 41, lines 12-13. Lines 22: As Engelmann and Merkelbach rightly note (following Wilamowitz), the θυσθά mentioned here as a last category of sacrifice probably represent the offering of aromatics or incense (cp. the term θυμίαμα), perhaps also other forms of burned offerings. Indeed, no portions of meat are to be offered on the table in this scenario. Instead, two different types of cakes are mentioned. The first, φθόϊς, designates a specific type of glutinous cake and can also mean a pastille made from liquid aromatics or incense used for fumigation (cf. LSJ s.v. 1 and 2); the other is a Hermes-cake (probably shaped like a herald's staff, κηρύκειον), see here CGRN 49 (Chios, but here perhaps offered in a cult of the god Hermes himself). Lines 27-30: For the sacrifice of the city "on behalf of everyone", Engelmann and Merkelbach aptly compare the more detailed passage in the festival regulation from Magnesia-on-the-Maiander, CGRN 194, lines 21-32. On preliminary sacrifices, particularly in connection with cults of Asclepius and incubation rituals, see here CGRN 46 and CGRN 54 (both from Piraeus). Lines 30-36: For the sacred portion, a technical term for the portion of the god offered and consumed on the altar during the sacrificial ritual, cp. here CGRN 39 (Miletos), lines 6-7, where it perhaps meant a portion from the shoulders of the animal (rather than the ὀσφύς, though that also remains a possibility; see Dimitrova for discussion; cf. the Commentary there for further references, and cp. the term θεομοιρία, which on Kos could designate such a portion (e.g. CGRN 86 D, line 20). CGRN 76, l. x-x (http://cgrn.philo.ulg.ac.be/file/76/). <lb xml:id="line_36" n="36"/><name type="invocation"><w lemma="Παιάν">παιῶνα</w></name> <w lemma="εἰς">ἐς</w> <w lemma="τρίς">τρίς</w>· "ὤ <w lemma="ἰή">Ἰὴ</w> <name type="epithet" key="Paian"><w lemma="Παιάν">Παιών</w></name>" κτλ. <p>[...] à Asclépios [...] (5) chacun des deux [...] et s&apos;il sacrifie [...] qu&apos;il sacrifice également [à ...] déposer et [...] pour de la viande de chèvre [...] (10) à Asclépios. À [...]  qu&apos;il sacrifice tout ce [qu&apos;il veut ...] à Apollon et [à Asclépios] sacrifier conjointement un [&apos;gâteau-Hermès&apos;] sacré. [S&apos;il sacrifie un bovin] à Apollon ou à Asclépios, [sur la] table, (15) qu&apos;il place [pour chacun des deux dieux] trois portions de viande de boeuf, [les viscères et], pour le prêtre, deux oboles. S&apos;il sacrifice [à l&apos;un des deux] un animal sacrificiel adulte, qu&apos;il place sur la table [de chacun des deux] trois portions de viande [et] de viscères (20), et une obole pour le prêtre. S&apos;il sacrifie un [animal de lait], trois portions de viande et de viscères. [S&apos;]il sacrifie des substances à consumer, qu&apos;il place un gâteau plat et un &apos;gâteau-Hermès&apos; pour chacun des deux dieux. Tout ce qui a été déposé sur [la] table reviendra (25) au prêtre en parts d&apos;honneur. Quand la cité procède au sacrifice pour Asclépios, les offrandes de la cité doivent être sacrifiées d&apos;abord au bénéfice de tous; qu&apos;aucun particulier ne procède à un sacrifice préliminaire pendant la fête. En tout autre temps, que l&apos;on procède au sacrifice préliminaire selon ce qui (30) a été écrit (ci-dessus ?). Ceux qui, après avoir procédé à l&apos;incubation, offrent un sacrifice à Asclépios et à Apollon ou ceux qui, ayant fait un voeu, offrent un sacrifice, quand la part sacrée est déposée (sur l&apos;autel), entonneront le péan d&apos;abord autour (35) de l&apos;autel d&apos;Apollon, à trois reprises le péan que voici : ô iè Péan, etc. <p>Lines 20-21: For suckling animals, see again <ref target="CGRN_64">CGRN 64</ref> (Epidauros), lines 7-9. It is unclear if the entrails mentioned in these lines and probably in line 16 represent the totality of the entrails from each given sacrificial animals, or perhaps more likely (given the absence of a definitive article), a portion of these entrails. For entrails offered on the cult-table, see here <ref target="CGRN_182">CGRN 182</ref> (Mytilene); for entrails placed on the hands or knees of divine statues in Chios, see <ref target="CGRN_41">CGRN 41</ref>, lines 12-13.